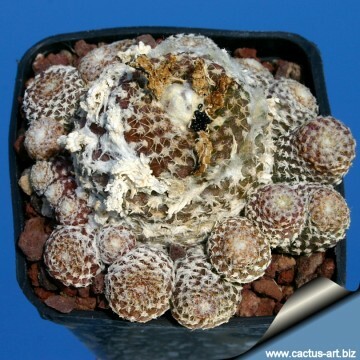 Copiapoa hypogaea var. laui (Diers) A.E.Hoffm. Copiapoa hypogaea var. laui (Copiapoa laui) Photo by: Andrea B.
FK 439 Esmeralda Guanillos, Chile It is the smallest of the Copiapoa's and a very attractive clustering variety with lots of small heads when mature. 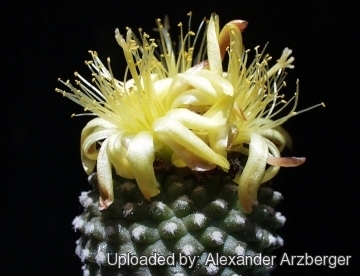 It is easily identified just by its small size, brown soft stems, minute spines, large yellow flower and large tuberous root. It is the only Copiapoa where the side branches form their own roots. 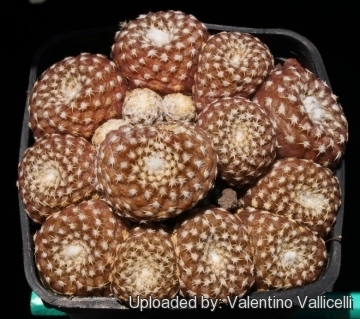 Origin and Habitat: Copiapoa laui comes from Planta Esmeralda (Coastal Chile, 02 Antofagasta). Habitat ans ecology: The species grows in fairly flat, gravelly areas near the top of low coastal hills (lomas costeras). The major threats are illegal collection and guanacos, which dig them up to eat the plants as they lack spines. 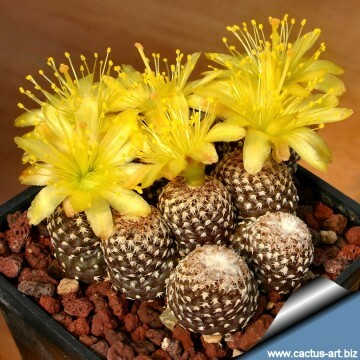 Description: Copiapoa laui is a miniature, clustering copiapoa, with mall stems of about 1 cm and offset to make big mats that are flat to the ground in habitat but form mounds in cultivation and it is difficult to walk without stepping on the heads. C. laui is the smallest species in the genus, this was only discovered in the 1970s and was thought at first to be a species of eriosyce. Derivation of specific name: This member of the Cacataceae family was given the name 'laui' for Alfred B. Lau (fl. 1970-), German plant-explorer and self-named missionary in Mexico, and later in Belize. Stems: 1(-3) cm in diameter, that grows partially underground, 1 to 1.5 cm high, clear grey to red-brown-grey, sometimes greenish. Top sunken covered with whitish wool. Ribs: 15 to 20 more or less dissolved into low small tubercles forming vertical rows or spiralled. Areoles: 0.7-1 mm in diameter about 2 mm apart. Redial spines: 4 to 7 insignificant, very small and bristly, whitish to yellowish. Central spine. Usually absent, occasionally 1 central spine similar to the radials. 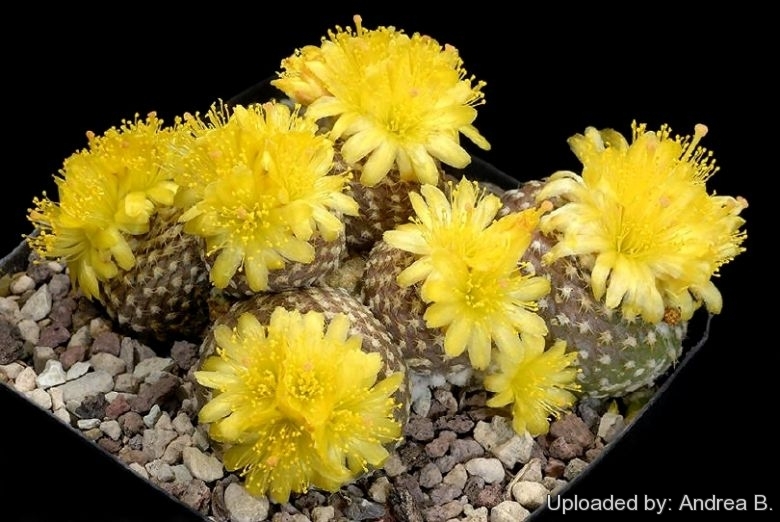 Flower: 1.5-2.2 mm in diameter, yellow with reddish petal tips, short, wide funnel-shaped. Fruit: Globular, 3-5 mm across, greenish-brown with shiny black seeds. Roots: Each head has a thickened, turnip-like taproot, so propagation is easily achieved by removing an offset with its root already formed. Seeds: 1-1.15 x 0.7-09 mm. Similar species: Copiapoa laui is closely related Copiapoa hypogaea and often recognized as a subspecies of the latter. However, most experts consider subsp. laui to be a separate species. Copiapoa hypogaea F.Ritter: has partially underground stems 3-4 cm in diameter, connected though a narrow region to the tuberous-napiform root. Distribution: Chañaral. N. Chile. Copiapoa hypogaea var. 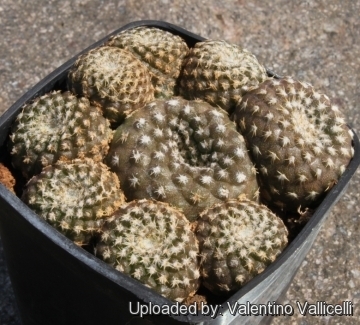 barquitensis f. cristata hort. Copiapoa hypogaea cv. Lizard Skin: This is the form of Copiapoa hypogaea distinguished by a very peculiar epidermis of the colour and texture of a lizard. Distribution: Chanaral (Coastal Chile, 02 Antofagasta), at north of the town. 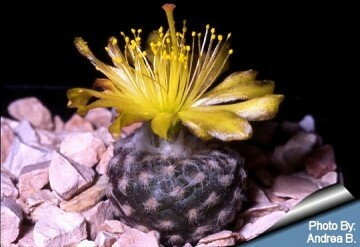 Copiapoa laui Diers: (Copiapoa hypogea var. laui) is the smallest species in the genus. Stems 1(-3) cm in diameter, 1 to 1.5 cm high, clear grey to red-brown-grey. Distribution: Esmeralda, N. Chile. 5) Faundez, L., Guerrero, P., Saldivia, P., Walter, H.E. & Avilés, R. 2013. Copiapoa hypogaea. The IUCN Red List of Threatened Species 2013: e.T152083A595222. http://dx.doi.org/10.2305/IUCN.UK.2013-1.RLTS.T152083A595222.en. Downloaded on 03 November 2016. Copiapoa laui at anthesis This species start flowering when still very small. 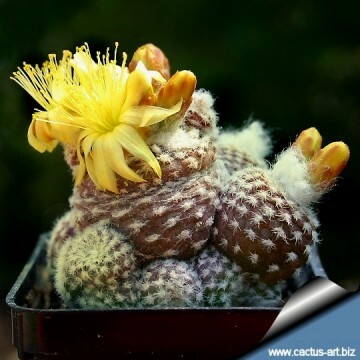 (Copiapoa laui) Photo by: Andrea B.
Cultivation and Propagation: It is a summer-growing species fairly easy and robust to cultivate, but very slow growing. This plant is xerophytic, adapted to dry soils and is quite susceptible to over-watering if kept in a non ventilated place especially after the first flowering. It flowers freely with the usual yellow flowers. Soil: Grow it in an open mineral, sandy-gritty cactus compost and provide a very good drainage. Exposure: It is suited for sunny-brightly exposure, but can tolerate light shade. However it will do its best only with lots of sun and become stressed with inadequate light which could result in poor growth and unnatural shape. It has a good heat tolerance. Watering: Waterings should be rather infrequent to keep the plant compact, and avoid its becoming excessively elongated and unnatural in appearance. Furthermore it has a tap root, and watering it properly is often difficult, because it tends to crack open or rot if over-watered. Keep dry in winter or when night temperatures remain below 10° C. Mature individuals easily rot and die especially after transplanting so be extremely cautious with watering. Water it less than average if in bigger pots. 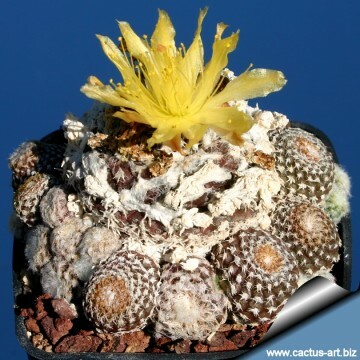 Fertilization: Feed them once during the growing season with a fertilizer specifically formulated for cactus and succulents (high potash fertilizer with a dilute low nitrogen), including all micro nutrients and trace elements diluted to ½ the strength recommended on the label. They thrive in poor soils and need a limited supplies of fertilizer to avoid the plants developing excess vegetation, which is easily attacked by fungal diseases. Special need: It is suited for airy exposures. Provide very good ventilation. Nearly all problems occur as a result of overwatering and poor ventilation, especially when weather conditions are dull and cool or very humid. They must have very dry atmosphere. Hardiness: It likes warmth (recommended minimum winter temperature 5° C) But plants kept perfectly dry can easily survive a light frost. - Red spiders: Red spiders may be effectively rubbed up by misting the plants from above. - Mealy bugs: Mealy bugs occasionally develop aerial into the new leaves and flowers with disfiguring results, but the worst types develop underground on the roots and are invisible except by their effects. - Scales, thrips and aphids: These insects are rarely a problem. - Rot: Rot is only a minor problem if the plants are watered and “aired” correctly. If they are not, fungicides won't help all that much. Reproduction: From seed, plantlets, or grafted. Seed is easy to grow but the seedlings are slow for a couple of years. The seeds can be sown in pots of fine, well-drained sandy soil, any time during the spring when temperatures are warm. Cover the seeds with a fine layer of grit and water from below with a fungicide to prevent damping off. For the 1-2 weeks cover the pots with a sheet of glass/clear perspex to keep the humidity levels high. Remove the glass and replace it with light shade-cloth and mist once or twice a day for the next two weeks after which most seeds should have germinated. From then on mistings can be reduced to every second and then every third day as the little plants grow. The seedlings should not be disturbed until they are well rooted after which they can be planted separately in small pots. Sometimes it is grafted to avoid root rot problems as plants grafted on an hardy stock are easy to grow and no special skill is required.